Spring officially arrives this week, and with it comes the start of berry season here in Southern California. First to appear are red and delicious organic strawberries, followed by sweet-n-tangy raspberries, plump blueberries and one of my personal favorites – blackberries. It’s no secret that we get a little excited about fresh berries around here. And rightly so! They’re not only absolutely delicious, but they’re chock full of beneficial nutrients and antioxidants too! That’s why they’re a favorite for enjoying in fruit salads and adding to grain-free granola, yogurt and desserts. Of course, they also make amazing jams and preserves, which is why I’m sharing a simple method for making your own delightful honey sweetened fruit preserves using your favorite seasonal berries. 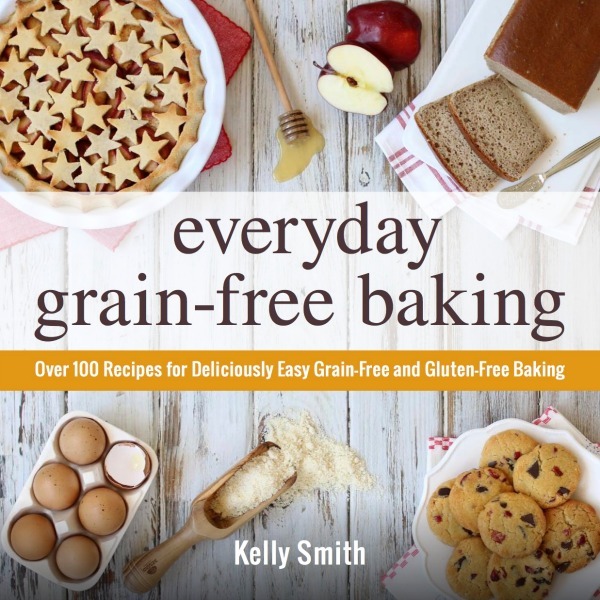 A key part of this method is a little secret I learned from one of my favorite grain-free cookbooks. The secret? Cranberries! By using a small amount of whole cranberries, you can avoid using powdered pectins to set your preserves. That’s because cranberries are high in natural pectin. So by including them in the recipe, your preserves will set-up nicely with just a little touch of fresh-squeezed lemon. 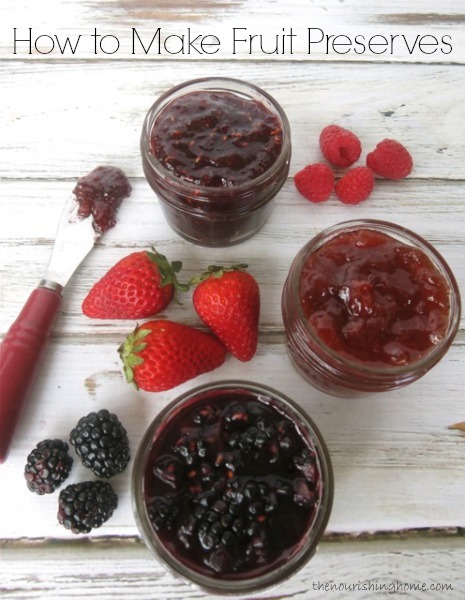 This easy recipe will enable you to make delicious berry preserves with less fuss and more all-natural flavor. Shown above (left to right): Blackberry Preserves, Strawberry Jam and Raspberry Preserves. Yum! What to do with all that delicious homemade jam? 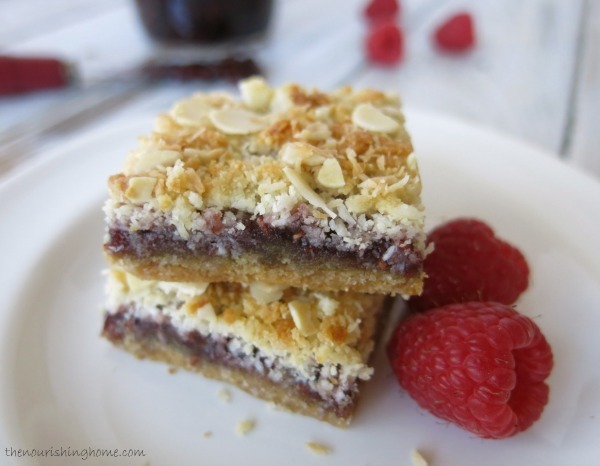 Why not make these amazing jam-layered crumble cookie bars! Mmm, they are soooo gooood! This special recipe at Deliciously Organic highlights the sweet fruity flavor of preserves sandwiched between two layers of scrumptious cookie crumble. Yes, please! P.S. Looking for more delicious real food recipes? Subscribe to The Nourishing Home and you’ll receive FREE weekly whole food meal plans, exclusive recipes and lots of helpful resources for living a more nourished life! Click here to subscribe and you’ll also receive my free eCookbook. Please Note: If making strawberry preserves, remove the stems and quarter the strawberries before measuring out 4 cups. For raspberry or blackberry jam, simply cut the berries in half before measuring. If making blueberry jam, no need to cut them. Because homemade jam/preserves do not contain any preservatives, I recommend placing one jar in the fridge to enjoy now, and freeze the three remaining jars for future use. Recipe Variation: You can also combine berries to create delicious flavor combinations, such as my popular Jumble Berry Jam recipe. Will Cranberries Affect the Flavor of my Jam? Yes, slightly. Cranberries will add a slightly tangy undertone, that is actually very pleasant in balancing the sweetness of the honey. This slight tartness may be more noticeable with milder fruits like strawberries, depending on your taste preferences. If you're not a fan of cranberries, there are several things you can do if you wish to avoid their slight tart undertone ... First, I've found frozen cranberries to be less tart in flavor. Second, you can decrease the amount of cranberries to 3/4 cups and increase the berries by 1/4 cup. The jam won’t be as thick, but with milder fruits, such as strawberries, the mild tartness will be less noticeable. In addition, if you are able to tolerate pectin (some diets restrict it), then you could opt to bypass the cranberries altogether and use a little Pomona’s Pectin instead to help thicken your jam, as I did in my homemade Peach Preserves recipe, since peaches are an especially mild fruit. 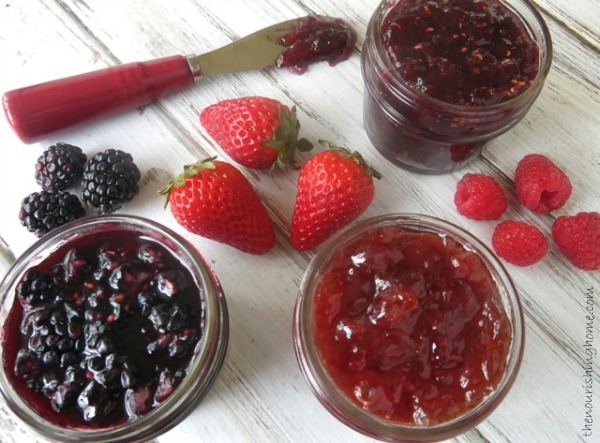 Did You Know: The words "jam" and "preserves" are often used interchangeably. However, there is a slight difference between the two. 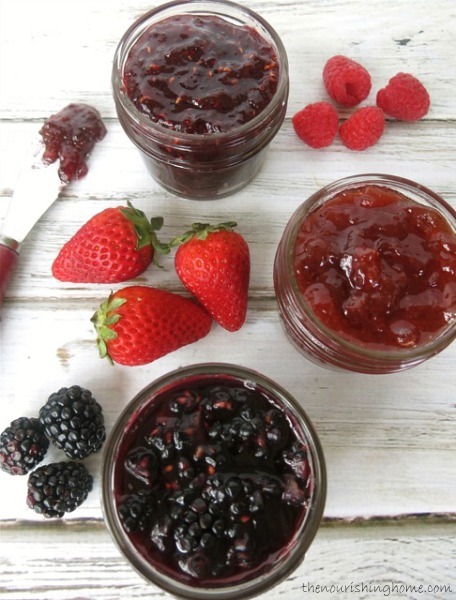 The fruit in preserves is often cut into chunks and allowed to remain somewhat whole, whereas jam is made using crushed or mashed fruit, which gives it a less chunky texture. So for this recipe, you can mash the fruit thoroughly during the cooking process to create a classic-style jam, or you can leave much of the fruit intact to create traditional preserves. Either option is delicious! I really like the idea of using honey in preserves. I do have a couple questions. I’m not really a fan of cranberries or cranberry sauces so I wonder how noticeable the cranberries are? Can these be preserved like a jam with a water bath rather than freezing? Thanks for a great site. Hi, Deb. Great question. I am going to note this in the recipe since several have asked. With regard to your question about the cranberries. They do add a little tartness, especially with milder fruits. (Frozen cranberries are less tart.) But one thing you can do is decrease the amount to 3/4 cups of whole cranberries and increase the strawberries by 1/4 cup. The jam won’t be as thick, but with milder fruits it will be less noticeable (the slight tartness), if you use a little less cranberry. In addition, you can bypass the cranberries altogether and use Pomona’s Pectin (http://amzn.to/1hpVqBS) instead, if you are able to tolerate pectin (some diets restrict it). This would be the easiest option to ensure absolutely no tartness or cranberry flavor for those who dislike them. So excited about this one. Our local food stop is offering 30 pounds of frozen organic strawberries right now and I’ve been waiting for an excuse to make preserves! Only thing stopping me was wondering if there was a way to make preserves without the ton of sugar. And any comments on how the cranberries affect the flavor? With regard to your question about the cranberries. They do add a little tartness, especially with milder fruits. (Frozen cranberries are less tart.) But one thing you can do is decrease the amount to 3/4 cups of whole cranberries and increase the strawberries by 1/4 cup. The jam won’t be as thick, but with milder fruits it will be less noticeable (the slight tartness), if you use a little less cranberry. Wow! I am so excited about this recipe! My family loves freezer jam, but since ridding our home of refined sugars, I have been in a conundrum how to utilize honey in its place and without using packaged pectin! What a relief! Thank you! This is great, thanks! We do like things not as sweet, tho. Is there any problem with cutting the honey to a 1/2 cup, or even possible a 1/4? Thanks! I cannot wait to try this!! Thank you for sharing your recipe! Thank you for this recipe. Do you think that we can use the recipe for any fruit? Hi Kelly. Thank you for your answer. I’ll try something! I still have some pumpkin from last Halloween and everyone is tired of pumpkin pie, bread, soup…….. This recipe looks great! I can across it via Deliciously Organic and can’t wait to try it. I have made homemade preserves before but always found them too runny. Hoping the addition of cranberries will help! Have you ever tried making a lemon preserve? My oldest daughter LOVES lemons ( especially lemon yogurt). I was hoping to make a homemade lemon preserves to add to plain Greek yogurt vs the one wallaby brand I buy (way too much sugar and the yogurt is fat free). Any ideas on how I might accomplish a lemon one? Thanks so much!! I just made this from frozen, mixed berries, which I defrosted and drained the juices. I also used 1 cup of frozen cranberries and 1 cup of honey, and 1/2 fresh lemon, squeezed. I will add a bit more honey next time (even my tart-loving husband suggested this), but it still delicious! I will definitely be making this again and going forward. No refined sugar and no processed pectin? I love it! Yay! So glad you enjoyed the recipe Jenn. I love Mixed Berry Jam too and have a recipe here that is similar to this one. Happy Spring! Hello. I have not heard of freezer jam before. I understand your recipe but I have a few questions. How long should/could it remain in the freezer. How do you use it once it’s been frozen? Is there a special way to thaw it? Thank you so much for this recipe! My kiddos like to eat PB&J almost everyday, so I have been investigating jams that doesn’t use refined sugar. I am curious if you could sub apples for the cranberries since they have pectin, as well. Would the ratio stay the same? Thank you so much for your quick reply! You are amazing! I made this recipe with raspberries, best jam ever! Better than anything I’ve ever had from the store! I’m looking forward to trying this recipe. Thank you for posting it. How long will the finished preserves last in the refrigerator? How long will they last in the freezer? And finally…once they are thawed from the freezer…how long will they last in the refrigerator? Perfect timing to stumble across your jam recipe. I had just bought fresh cranberries and wondered what to make with them beside more cranberry sauce. So excited that I used what berries I had on hand…blueberries and red raspberries. This recipe turned out great and so yummy I’m licking the spoon right now! What a great recipe! I was looking for a strawberry jam made with honey and came across this one. And then I blogged about it! (http://approachingfood.com/life-of-pie-part-ii-cranberry-crackle-tart-and-pectin-free-jam/) I really like that I can make jam without refined sugar and without processed pectin. What a great idea! Well, that’s the biggest compliment to have someone share via their blog. So thank you for the sweet shout-out. I am so happy this recipe has blessed you! Thank you for being a blessing in return! 🙂 Happy jam making! Hi! wonderful recipe – cannot wait to try it! I wanted to make Strawberry champagne jam (had some in London and it was wonderful!). My question is, think I could add it this recipe, will it make it too watery and lastly will it help with the tartness of the cranberries? Have you ever tried using agave nectar instead of honey? Have loved the results with honey, but would like to modify the recipe for a friend who can’t have honey. So, in step number two where you are supposed to be bringing the berries and honey to a boil, are you supposed to be adding water I assume? It never actually says that….. I made this once and it was SO GOOD! The second time, though, it was a little bitter. I am wondering if I cooked it too long. Is there something about cranberries or honey that causes them to get bitter if cooked too long? (I simmered it for a couple of hours to thicken it up more.) I am so sad that it is not as good – I made a double batch this time! I’m not sure what the issue might have been, but perhaps the cranberries you used this time around were much more bitter? I’m sorry that happened, especially since you made a double batch! Will this work with figs?